A slab leak can be one of the more frightening experiences a homeowner has to deal with when it comes to emergency plumbing problems. Actually, that is a bit of a misstatement, because they aren’t usually an emergency at all, although they are often thought of as one. Quite often a slab leak isn’t even discovered until a homeowner finds themselves with a huge water bill. They will call a plumber out to try to figure out why, and the plumber will inform the homeowner that they have a water line leaking under the slab. That means that the leak has been there for around a month or so already – so much for an emergency. First of all, I want to let you in on how I used to find leaks under slabs. This might help you, since most pros do it the same way. Obviously the first thing to consider is whether the house is really on a slab. If you don’t know whether your house has a crawl space, just stomp on the floor once. If you get a hollow sound, you have a crawl space, and the leak can be looked for there (once the access is found). If it is solid and unyielding, you are likely on a slab. The next thing is to try to figure out whether it is the hot or cold water. Simply feeling for hot spots on the floor may be the easiest way to tell. Even if I do not find any hot spots, I will usually turn off the hot water and see if the leak stops. You can usually hear the leak when walking throughout a house. In the rare instance where you cannot, watching the meter will tell you if the leak has stopped or not. I do need to backtrack a bit. It is very important that you or the plumber check every fixture very thoroughly to make sure that something else is not leaking. I cannot count the times when what others thought was a slab leak, I found was a leaking hose bib, irrigation valve or toilet. Even good plumbers overlook this sometimes. It happens. If you are lucky enough to have a wet spot or a hot spot on the floor, then you have a bit of a head start. That will usually show you the area of the plumbing leak, but not always. Do not depend on that, however. I have seen leaks that were up to 10 feet away from the only wet spot. Water finds the easiest avenue to escape, so what might seem like a spot where the leak is could easily be the spot where there is a crack in your slab. The next thing I will usually do is try to map out where the pipes go. I can often do this based on my experience, but it never hurts to actually locate the pipes with an electronic pipe locator. This is not essential, but it makes finding the leak a lot faster, because you only need to look where the pipes are. If you don’t know where the plumbing runs under your slab, you will be “looking” for leaks everywhere, including where there are no pipes. Next, find the general location. If you don’t have a wet spot or a warm spot, you need to very carefully listen for where the sound is loudest. Listen behind the toilets, under the sinks, etc. The pipes are usually noisiest nearest the leak. Once you have the general area located and know where the pipes are, you can begin the fun part. I have an air compressor (a very quiet one) and an adapter that I made so that I can connect an air hose to an outside hose bib. I keep the compressor in my truck with the doors closed to further minimize the sound. Then I turn the water off at the main and pump air into the line at about 60-80 psi. I try to keep it near the working water pressure of the house, so I don’t force air into the city main. I will go into the house and open up one of the faucets until that faucet starts to spit. I then turn the faucet off and let the compressor catch up. Some very helpful will happen. The air, mixed will small amounts of water will make a very specific and recognizable sound as it exits the leak. The pipes themselves will burble and such, but there will be a distinct “spitting” sound at the leak. Now you just have to find that sound. I use one of two things when listening for the sound. The one that I use primarily is called a Geophone. You can actually get these (if you are so inclined) from PollardWater. There are also a variety of electronic listening devices on the market. They are a lot more expensive. The Geophone will cost about the same as someone doing leak detection for you, so unless you plan on having a lot of slab leaks, it is probably best to get a pro to find it. Still, it never hurts to know the process, so you are informed. 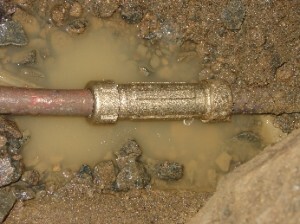 Once the leak is found, fixing it is really not that hard. It is a bit dangerous though, so I do recommend having this done by a pro. Basically the process starts with removing the flooring; whether it is tile, linoleum, wood, carpet, etc., then using a small jackhammer to remove a section of concrete. I try to keep the hole as small as I can – just big enough to work in. Next, the leak needs to be positively located, and a section of the leaking pipe removed and a new piece tied in. Do not allow someone to “patch” the pipe. The section must be removed and replaced. Now, let me stop for a second and tell you that this is meant to be done with copper pipe. 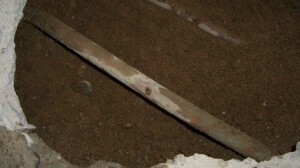 There are still homes out there that actually have galvanized water piping under their slab. If that is you, I do not recommend trying to repair it. The best course of action in this case is to do what is called a partial or full bypass. That basically means that you need to cut off the flow to some or all of your slab piping and run new pipes overhead. This is usually done within an attic. I have run across homes that do not have attics, at which point I needed to run the pipes on the roof. This is the way it has to be with Eichler homes. In fact, my “falling off the roof” incident happened towards the end of an Eichler re-pipe. 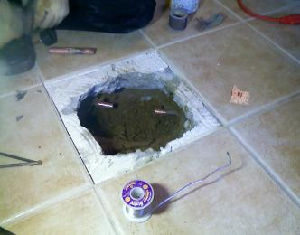 Finally, when the repair is made, I recommend turning the water back on to test before closing up the hole. Once it has been verified that there are no more leaks, I will get rid of the old soil that I took out to get to the pipe and fill with sand. I do this because the old soil is wet and will cause the concrete patch to settle. Sand will be compacted 100%, and will fill in some of the gaps as well that were created by the leak. Next, you just poor concrete into the hole, level it off and let it cure. I recommend leaving it uncovered for at least 7 days before replacing your floor covering. It sound like a pretty big process to go through – and it is. Different companies in different areas charge different amounts for these, but I use to charge between $2500 and $3800 to find and fix the leak. That included replacing the concrete to “patch” finish. One final little bit of info for you, and this may be the most helpful part of this article: Check with your insurance company and find out if they will cover you, and if so, what parts they cover. In my area, many of the good homeowner’s insurance companies will pay for the leak location, the tearing out of the flooring and concrete to “access” the leak, and the replacement of the concrete and flooring. Knowing this can really help. The repair of the pipe is the easiest part, and can easily be shown on the invoice to have cost $150 or something, while the rest of it would be covered by your policy. Out of all of the slab leaks I have repaired, I would say that about 80% were covered. They will NOT usually cover a re-pipe however, but that is in my area, yours might be different. If you find the information on this site useful, please spread the word! What great information! Thank you. You are welcome. Glad I could help. Hi Steve – great info! If the average cost you use to charge is/was between $2500 and $3800, then how much would you estimate it would cost to do a full overhead repipe to both the hot and cold pipes? I would think that if a home has a slab leak in one area, there is a good chance there is or will be a slab leak in another area in the future so it may be best to just get the home repiped. What are you thoughts on that? Hi MT – Very good point there. There are a couple of other considerations though. Of course you are correct that if there is a slab leak once, there will likely be another at some point. That is a great argument for getting an overhead repipe. As for the cost… well, I used to do them in 1-2 days, with 2 plumbers, with a 1/2 day added to that (1 plumber) for permitting, inspection, etc. 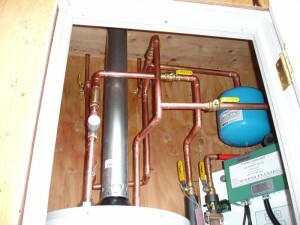 I billed repipes at around $1500 a day per plumber plus parts. That means an average of $7-$11k, depending on the size of the house, overhead access, different options (whole house filter, recirc system, etc.). Partials can be cheaper. Big houses with lots of options can be more. It is more expensive to do a repipe overhead, than in an under-house crawl space though. So, yes, for the price of roughly 2-3 slab repairs, you can get the house repiped, and never have to worry about it again. There is a complication, however, that sometimes comes up. Where I live, a lot of insurance companies will reimburse the homeowner for some or all of the slab leak repair. This could result in the homeowner paying as little as a couple hundred dollars (plus deductible). Most of them will not, however, reimburse for a repipe. Although that sounds kind of silly, it is true… at least here in Cali. Some homeowners still decide to go with the repipe option, though. Long term, it is a better investment in the value of your home, and the peace of mind alone can be worth the cost. Depends on the homeowner, I guess. Steve, thanks for this article! We were just quoted $4.5k for a seven foot tunnel or $3k for a jackhammer job from a plumber that has helped us out in the past. As much as we like him, this made us pretty sick. I went looking (a bit guiltily) to see if this quote was reasonable and from reading your article, it sounds like it. Unfortunately here in north Texas, homeowners policies no longer include foundation/slab issues (you had to start buying a separate policy rider sometime in the early 90s). That’s the worst thing about this issue down here: you could have one pop up again a year after getting one fixed. Home ownership is seriously overrated! This winter I came home, the day before a business trip, to find the hot water flex hose had sprung a leak, blasting through the heater wall into the garage, flooding it and part of the master bath closet. I couldn’t get a new flex hose back on(previous owner had a garden hose bib ending the line above the tank), and in a panic to make sure my wife had hot water during my absence, I googled “24 hr plumber” in my zip. Called the one closest to me, and long story short, the guy is licensed, etc., comes over at 9 pm and gets the flex hose on for me. Can you believe that? I called him and he did the job for $200. I’ve been loyal to him for that reason alone. Maybe I am a sucker, but you never hear of anything like that any more. Sorry, I just had to share that story. As for feeling guilty… while I am a firm believer in finding a plumber that you like and keeping him, there is nothing wrong with keeping him on his toes. More than once, I have had regular clients let me know that they felt a price I was giving them was a little high. It gave us a chance to sit down and discuss it in further detail… maybe I could trim a few bucks here or there, call in a favor, etc. It also gave me a chance to go over the details a little more specifically with them to make sure everyone was on the same page. Just for the record… I do not even know what I would charge to tunnel 7′ to get to a leak. How would I even keep my torch lit in there? I would have to make a cave! Awesome. Yea, you don’t see service like that much these days. Thanks for sharing. I have one spot on my basemant floor which is about 12 inches in diameter which stays wet. If I turn on the dehumidifier, it will disappear after a day or so and then reappear. We have an inside drainage system which takes ground water to a sump and then pipes it outside. The drainage field is about 8 inches from the spot. This concrete floor is a basement slab. The house is built on a poured foundation so technically it is not what one brings to mind when talking about a slab. Any idea how to find out where this water is coming from. I think it is perking up the concrete only at that spot. Thanks for any advice you may offer. Hey there. That is interesting. If I were there, I would have a slew of questions I would ask. Is the sump pump active on a daily basis? I don’t know where you are, but we are in a drought here. Also, the way you describe it, the drainage field is under the slab. If those two answers are a yes, I would guess that the field may be saturated or is somehow not draining properly. Another possibility is that the drainage line may be clogged, and/or compromised somehow. If the line is big enough, and you have access to it, a video camera can be put in the line to attempt to find the problem. Those are my initial thoughts. It would obviously be much easier to diagnose if I could see it. I would say get a plumber that you trust. Sounds like he will have to be a pretty skilled one. I wish you the best of luck. Home renovation and repairs can create unwanted junk and debris. 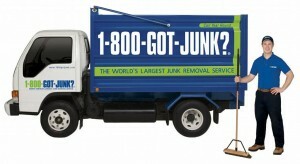 Call 1-800-GOT-JUNK? and get rid of your junk!